Is your little one walking around the furniture or using a push toy? Are they ready to move on and pull a toy with them? You might be wondering which are the best pull toys for babies and toddlers. These traditional toys have been around for many years. 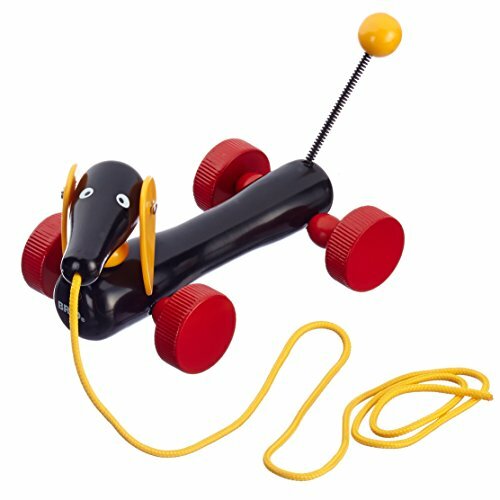 I remember having a pull-along telephone when I was a child, and my babies loved their pull-along dog. 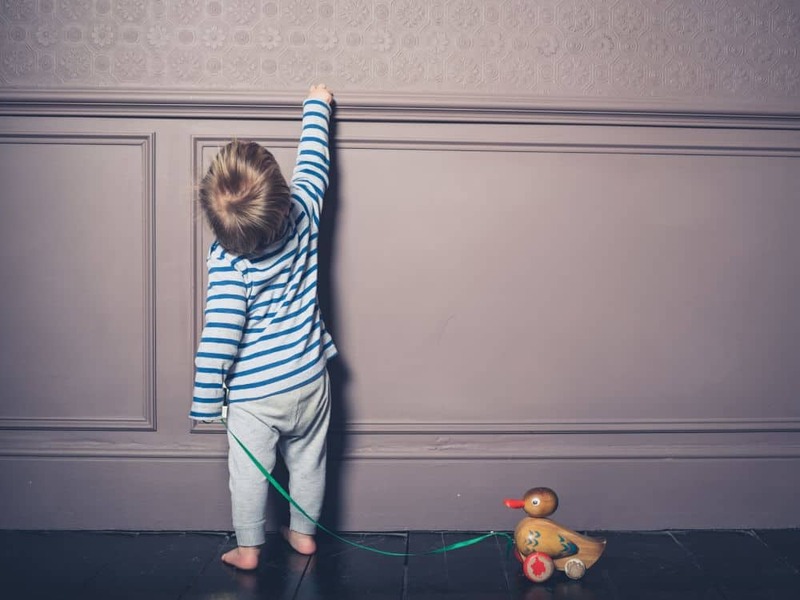 Let’s look at the benefits of pull toys, what to look for in a pull toy, and the best pull toys for babies and toddlers. Use the links above to check the latest prices or read our in-depth pull toy reviews below. While a child is learning to walk, a push toy is a valuable option, as it will help them balance and build their confidence. Once they’ve mastered this step, then they’re ready to progress to a pull toy. Some toys, of course, can be pushed and pulled. Pull toys require a little more balance and concentration. Your toddler will need to make sure they aren’t going to walk into anything as they check on their buddy behind them. 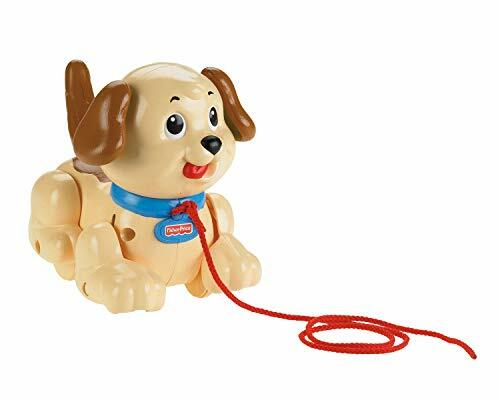 They’ll also need to be fairly steady on their feet as they take their pull toy for a walk, with nothing to help keep their balance (source). Pulling a toy along will help a child’s gross motor skills as they navigate around, and their fine motor skills as they grasp the string. It will teach them about cause and effect as the rolling of the toy is often accompanied by noises and movement. Coordination and problem solving can also be improved as they multitask: pulling, watching, navigating and balancing at the same time (source). Age appropriate: Choose a pull toy that is age appropriate for your baby or toddler. If you provide them with a toy that’s too advanced for them, they could get frustrated. The Center for Disease Control (CDC) claims that using a pull toy is an 18-month milestone, although every child is different (see video below). Weight: Make sure the toy is light enough for your child to maneuver behind them. However, it needs to be stable enough not to tip over all the time. String length: The ideal length of string on a pull toy should be 12 inches or less, to avoid strangulation (source). If it’s longer, either cut it short or make sure your toddler isn’t left unsupervised with the toy. Avoid beads or attachments: Steer clear of any attachments on the string which can form loops or nooses. String thickness: Make sure the string is not too thin, which could cut a child’s skin. It should be at least 1.5 millimeters or a sixteenth of an inch (source). Whether your child is learning to walk or is confident on their feet, pull toys can help them in their journey. Here are our top 13 picks of the best pull toys for babies and toddlers. This timeless wooden toy has been a favorite for over 60 years. 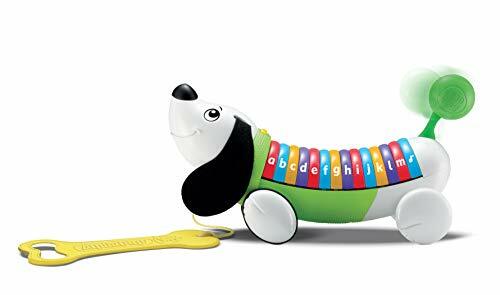 Kids aged 12 months and over will love pulling along the sturdy little dachshund. They’ll enjoy seeing its ears and tail waggle and the way the head turns. The gloss-paint finish over the smooth sanded wood is toxin-free, so no worries about safety here. This adorable little puppy wiggles its ears, shakes its tail, and barks as it follows your little one around. Suitable for ages 12 months and over, your toddler will enjoy taking it for a walk. Why not take the opportunity to use this pull along to teach children how to look after animals, by giving them pretend food and water bowls for it? 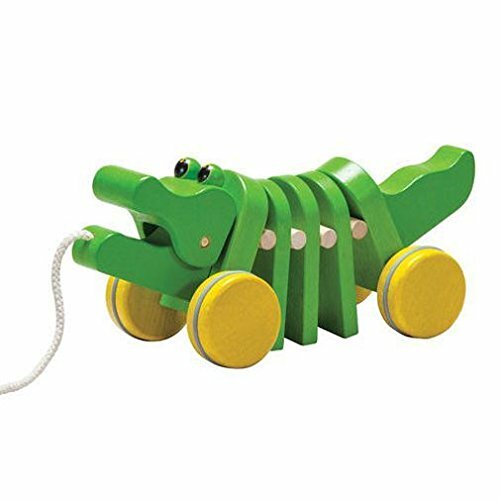 For 1-year-olds and up, this toy takes on double duty as a pull along and shape sorter. The snail’s shell can be removed and the three wooden blocks sorted through the shaped holes in the side. An elastic band on the other side allows easy removal of the blocks, but it stops them falling out when the toy is in motion. The snail tail waves as it’s pulled along, the shapes rattle, and the shell rolls. This little wooden duck will waddle along behind any child and is suitable from 12 months and older. Its head moves from side to side and its wings flap as it moves. The four bright red wheels are designed to roll easily along any floor surface. 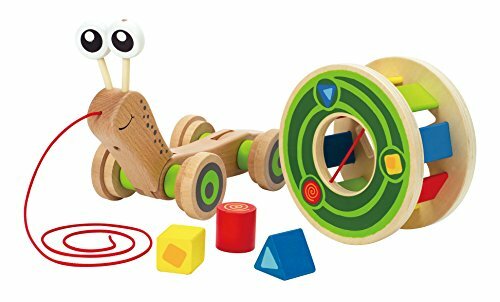 The pull toy is handcrafted from solid beech wood, and its painted surfaces are safe and non-toxic. This brightly colored car carrier has three cars, each with their own individual animal “drivers.” It has a CB radio for imaginative fun, which also teaches numbers and colors, and plays music and sounds. Each car recognizes its own driver and the carrier has a proximity sensor that acknowledges each car. This toy is great fun for stationary or pull-along play for kids aged 1 year and over. 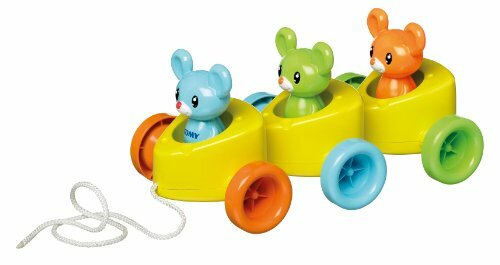 Three little mice sit in their own compartments and move up and down as your toddler pulls this toy along. They make a “tick-tick-tack” sound as they go. The mice can also be removed to be played with individually, and rattle when shaken. 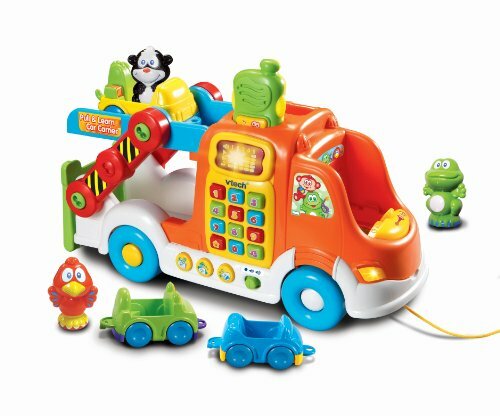 This fun pull along toy is for tots aged 12 months and over. What kid wouldn’t like to have their own wagon? They can move things around the yard, take their teddies for a walk or use it for “clear up” at the end of the day. 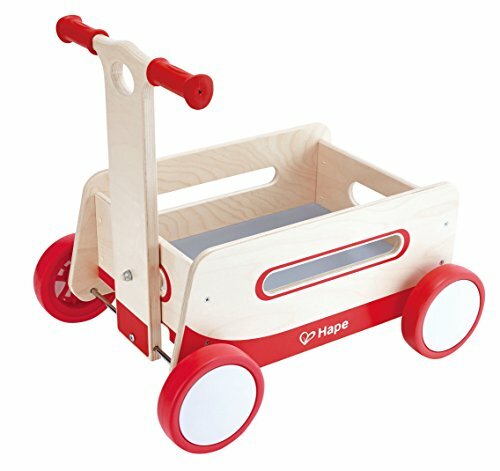 The wooden construction of the wagon is stable and all materials are safe for children aged 12 months and over. The handle can be locked into place to push, and released to pull. This wagon will probably be a favorite for a long while. Learn the alphabet with this interactive puppy pull toy. Turn it on and press the letters on the dog’s back to hear two phrases for each letter of the alphabet. You can also listen to the alphabet song, a numbers song, or a walking song as the toy is pulled along. I like this toy for its educational properties, as well as being a fun factor for babies between 12 and 36 months. A friendly green gator will follow your little ones around as it’s being pulled along. It will make a “click-clack” noise and open and close his mouth to keep kids entertained. The wheels are stable and move closer to, and then further away from, each other to make the alligator dance. It’s suitable for ages 1 year and over. As well as taking this puppy for a walk, your toddler can let its head dip to “sniff” the floor, and make it sit or stand. Its ears wiggle and its tail wags as it moves along. 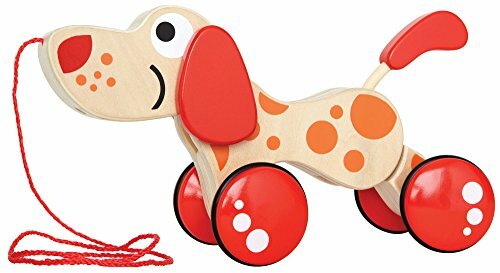 Made from quality wood and painted with bright orange spots, kids over the age of 1 will love taking their own puppy dog along for a walk. 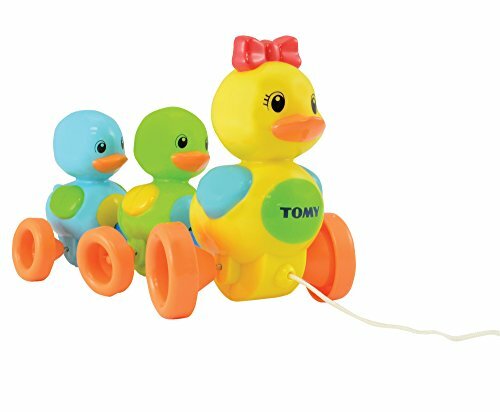 Suitable for babies over 10 months, as well as toddlers, this mommy duck and her two ducklings quack and waddle as they move. Made from high-quality safe plastic, this Tomy toy is easy to clean. Little ones will love the noise this makes, although — you’ve been warned — moms and dads might find it a bit annoying after a while. 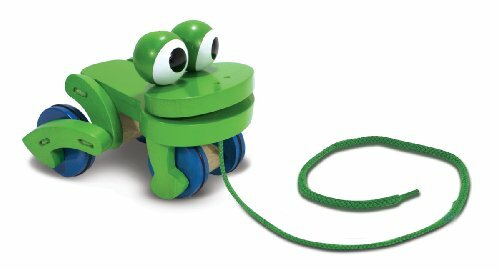 This friendly frog pull toy is suitable for toddlers from 18 months upwards. When pulled along, it leaps up and down and its googly eyes wiggle in its head. Walking along with this toy will be fun and exciting, and the brightly-painted colors will entice little ones to play with it. The non-toxic paint makes this a safe option. 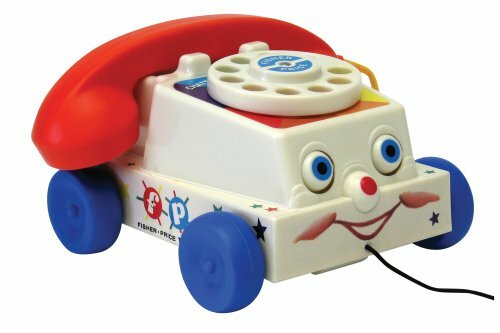 Back in the day before cell phones, this was a favorite toy with many kids. I remember using mine as a child, and the very same one is now being used by my own children. It’s suitable for toddlers aged 12 months and over. When it’s pulled along, the eyes roll up and down and the mouth chatters. For quiet play, the dial rings and the telephone can inspire the imagination. 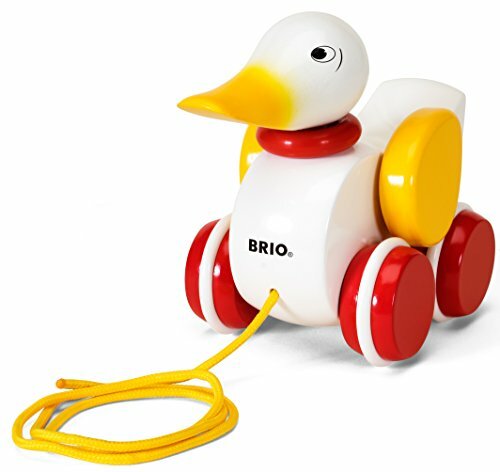 Of all the ones we’ve featured, my favorite is the old classic Brio Pull Along Dachshund. This simple wooden pull toy has stood the test of time and will engage babies and toddlers as much now as it always has. I hope you enjoyed this guide to the best pull toys for babies and toddlers. Please leave us a comment with your own experiences, and don’t forget to share.